ZHOL Blue LED Lighted Umbrella | Nerd Much? We’re not sure at what point umbrellas started looking so cool. It used to be that everyone just had a $10 umbrella from Wal-Mart that was typically black or a solid color, or — if you were lucky — you found one with a cool design. But what if your umbrella could do more than just inadequately shield you from the rain? What if it could light your way while giving you the feeling that you’re in a sci-fi movie? 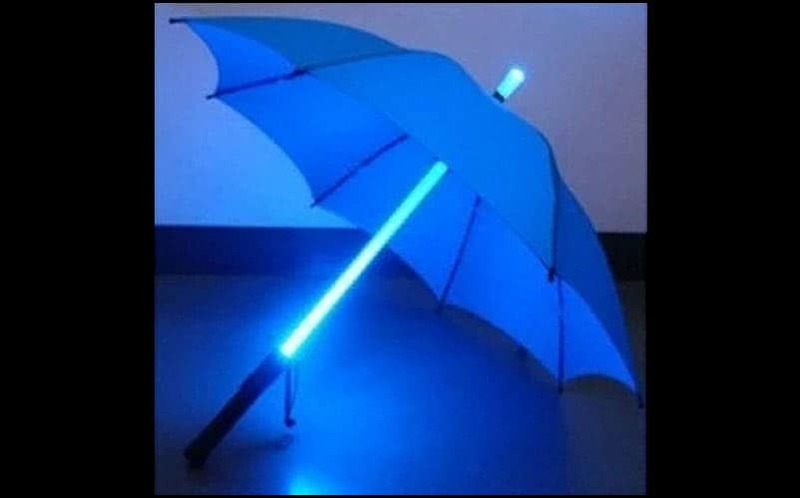 The ZHOL Blue LED Lighted Umbrella looks sort of like a JEDI light saber that has an umbrella on the end of it. I mean, that’s really all you need to know about it, right? It’s not licensed by Star Wars or anything like that, but it just looks like it should be. It’s powered by 3 button batteries. It’s futuristic and functional at the same time. It’ll help ensure that you’re seen by drivers on the road, all while letting the Imperial Army know that you’re ready at any moment. So if you’re in the market for a cool umbrella, here you go.